Bitcoin use and value is going to keep growing. It has been around long enough and has enough miners and nodes distributed around the world run by independent people that it is going to stay around for a long time. So it’s probably a worthwhile place to store some of your money. Bitcoin is also very easy to use as a currency. I can buy products from Overstock.com, Newegg.com, and GoldSilver.com with an easy transfer of Bitcoin. It works just as easily for international payments. Unfortunately, the Bitcoin and other crypto currency prices compared to state sponsored currencies like the US Dollar are volatile. The prices go up and down all the time. This is a one-month price chart of the Bitcoin to US Dollar price from the middle of December 2016 to January 2017. I am a really bad crypto-currency trader. Unfortunately I’m good at buying high and selling low — the opposite of what the best traders do. So it’s hard for me to pick a time and amount to buy any cryptocurrency. But what I can do is run a program that uses my computer’s graphics card, and have that program pay me in different crypto-currencies a little bit at a time. 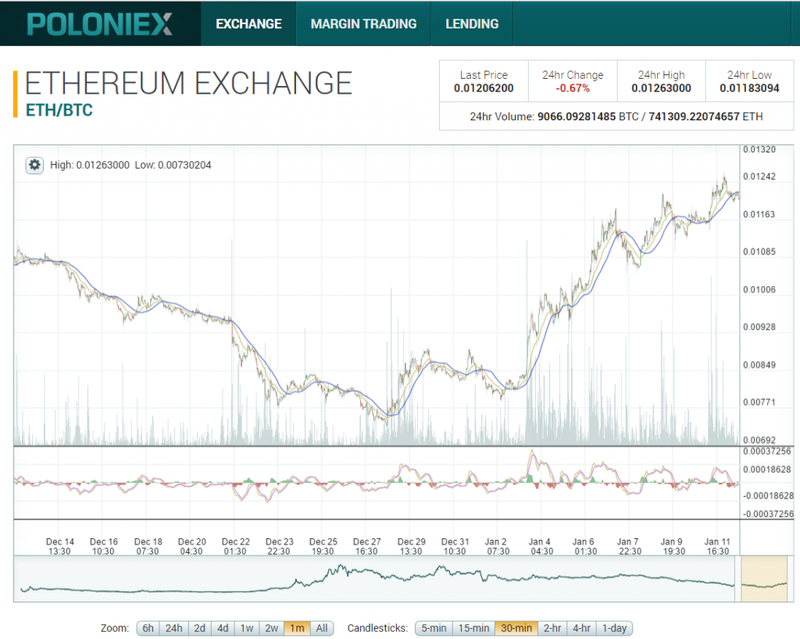 As these Altcoins build up in my account, I am literally making money. And it’s profitable! What you do with it after that is up to you. For just a little bit per month in electricity, you build up stock in Altcoins like Ethereum, Zcash, and Monero. If you want to save it for a long time and watch it go up in value, it’s like a savings account that automatically buys you a little bit of crypto-currency for a small monthly fee. You can also trade it into Bitcoin at an opportune time and either spend it directly or convert the Bitcoin to traditional currency whenever you want. Since these currencies are volatile, however, you probably want to accumulate them, place limit sell orders to catch the market at a temporary high, and maximize the return you get for your expenditure of time and money. 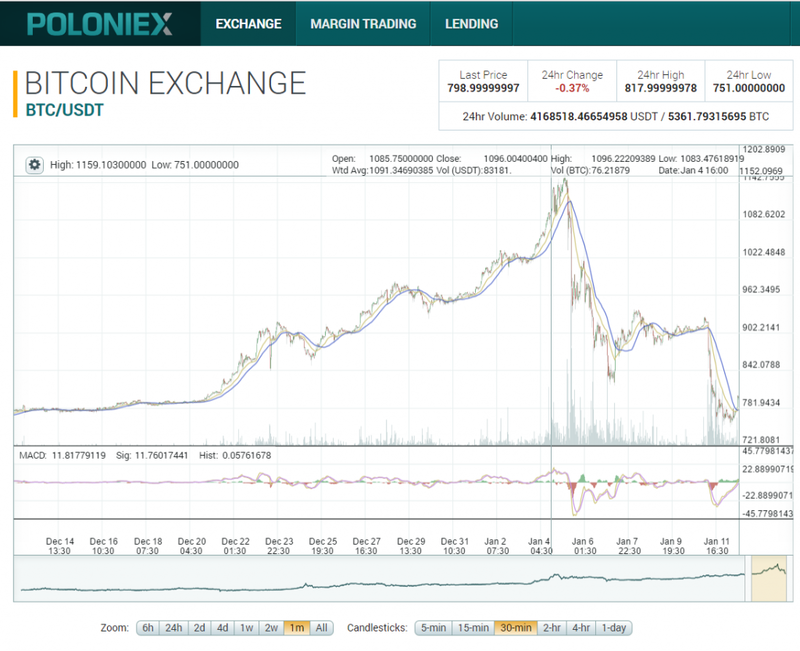 In the same timeframe as the Bitcoin price going down above, it was actually a great time for owners of Altcoins. Their values compared to Bitcoin went up. So while some people were selling Bitcoin, I was trading Ethereum for Bitcoin and getting more Bitcoin than I would have just a few weeks earlier. I did not buy the Ethereum, I mined it. And if the Ethereum to Bitcoin price continues to go up in the next month, I will have mined more by then to sell at the new and higher price! 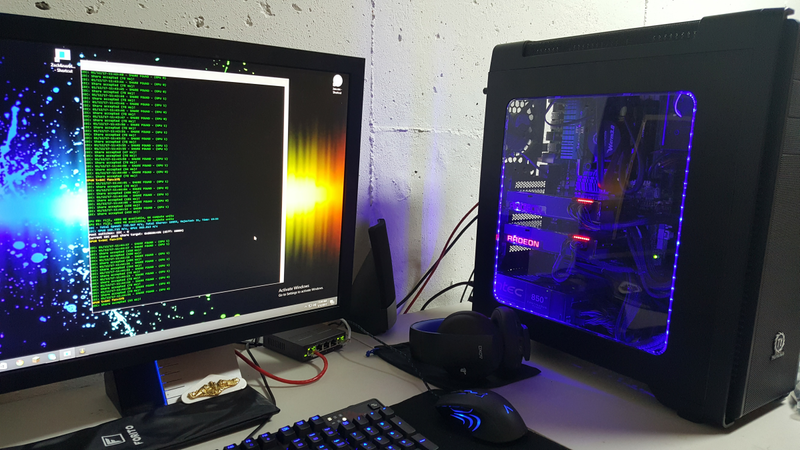 If you have a PC with an AMD or Nvidia graphics card in it running Windows, you can get started without spending any additional money at all! All you do is download, install, and configure an Altcoin mining application. Whenever you are not using your PC, run the mining program. It will take electricity and convert it into cryptocurrency for you. Here are the best mining applications right now for each of the Altcoins. If you click the link, it will take you to the message boards where the applications have download links. There are a lot of words and options — don’t worry about those for right now. Just download one of the applications, put it in your Documents folder, and unzip it. I recommend starting with Ethereum. Claymore is a guru programmer. He makes the fastest and easiest Altcoin mining programs for windows, and provides support by answering questions on forums. When you run his programs, 1–2% of your mining power is sent to him as payment. I’m fine with that, because I like paying for what I get, and his mining programs make me more Altcoins than the competition, even with the payment factored in. Whenever you are not using your PC, run one of those mining programs to generate Altcoins while you are out and about doing other things. As soon as you start mining, you’ll start to get paid in the first day or two. You do this by joining a mining pool. Each of Claymore’s mining applications is set up to mine to a pool. There are a lot of pools out there. Here are the ones I recommend to get started with. The pools even have a statistics page, and you can set up notification to let you know if your miner stops mining for some reason. In every Altcoin mining program, there is a place where you need to enter your mining pool address to mine to. This is not hard. Start by setting up an account at an exchange that only deals in cryptocurrencies. I use Poloniex, so I’ll use that one as an example. After you open up your account, go to the Balances, then Deposits and Withdrawals section. To find your Ethereum deposit address, click on ETH, then Deposit, and you’ll see an address. That’s it! Enter that address as your mining pool address in the Claymore program. The specific place to enter the address is in the config.txt file. Zcash uses a single address for mining, the t address. Monero requires both a Payment ID and a Deposit Address. Poloniex provides both for you. As you keep running your miner, the amount of Ethereum, Zcash, or Monero you own will grow. That’s exciting! I have other articles that recommend what to do with it, and how to keep it safe. After you get a little bit in your account, take a look at my recommendations on security. If you decide this mining is something you want to continue doing, a PC with a graphics card is not the most optimized system available. You are going to want to have dedicated hardware and be able to run the system remotely, with no monitor, keyboard or mouse. If you have a little bit of basic technical know-how, you can go one step better than mining with a gaming PC. If you build a GPU (Graphics Processing Unit, or graphics card) miner, for about $2300, you can have it run 24/7 and generate crypto-currencies for yourself. That’s where the 6-GPU Mining Rig comes in. You can build a relatively inexpensive mining rig that is maximized for GPU utilization and cooling. It won’t be useful as general purpose PC. These rigs can run either Windows or Linux. If you are going to have 3 or less, Windows is ok. More than that you really want to think about using Linux. It’s about the remote management. With Windows you have to set up an application that allows you to access the entire GUI desktop, and unless you pay for each copy of windows, it will update and reboot itself at inconvenient times. With Linux, it’s free, everything can be done using the command line, it’s more reliable, and is much less susceptible to viruses or hacking. Here is an article I wrote on building a Zcash Optimized 6-GPU Mining rig. It includes every single step you need to do in Linux to make it work. You can probably max out at about 5 mining rigs at the place you live. That should net you about $11,000 per year in cryptocurrency on average. First year of mining pays for the rigs, second year is all profit. For more than that, you are going to want a dedicated space with more power and airflow for cooling. 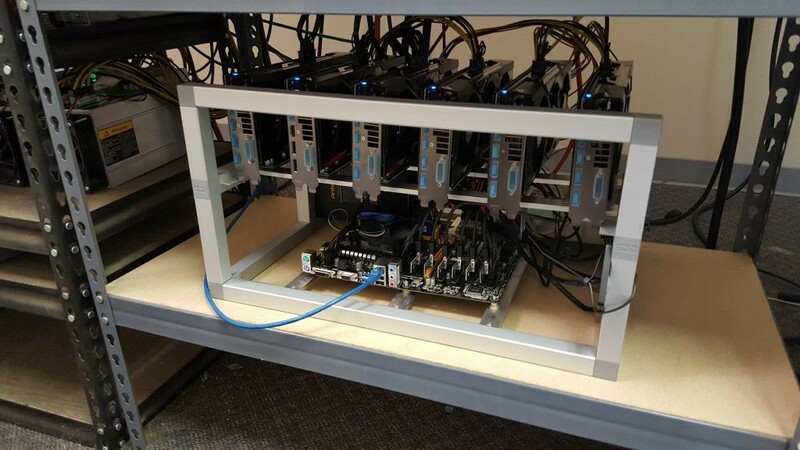 If you have the ability to build 20–30 mining rigs, you can rent yourself a small industrial space, put in a fan and a vent, and turn your mining operation into a small side business. If that works out for you, 200 rigs would get you a nice paying full-time business. Originally published at Block Operations.